For the 35th consecutive year, Wright State’s Model UN team received an “Outstanding Delegation” award at the National Model United Nations Conference. For the 35th consecutive year, Wright State University’s Model UN team won top honors at the National Model United Nations Conference in New York City. 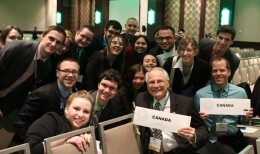 Joined by President David R. Hopkins, the team represented Canada’s foreign policy on 12 committees, with issues ranging from infant mortality to the prohibition of chemical weapons to the environment. The Model UN is a conference similar to that of the United Nations in which students participate as delegates to various UN committees. The participants research and formulate political positions based on the actual policies of the countries they represent. The Wright State students received the top “Outstanding Delegation” award, and Wright State delegates on six committees earned best position paper awards for their research. In addition, four Wright State students were voted best delegates in committee by their peers: Caitlyn Banis with the Commission on Narcotic Drugs; Jonathan Maze with the ECOSOC Plenary; Angie Loyd with the Peacebuilding Commission; and Andrea Jacoby with UNICEF. “When war is raging in Syria and possibly Ukraine, when genocide is still occurring in Africa, when human trafficking persists, it is necessary to help young people learn the skills of listening, problem solving and cooperation. This is what the Model UN offers,” said Donna Schlagheck, Ph.D., chair of the Wright State Department of Political Science and Model UN faculty adviser. At Wright State, preparation for the conference involves more than just writing papers and learning a country’s national policy. Delegates are taught how to implement a country’s policy, how to dress, how to act in committee and what to expect from other countries they will be working with in committee. This year’s conference was opened by United States Ambassador to the United Nations Samantha Power, an Irish-born American academic, author and diplomat. Twenty-three Wright State students and their faculty advisers—Schlagheck and Vaughn Shannon, Ph.D., associate professor of political science—attended the March 29–April 4 conference, which drew more than 2,500 students from two dozen countries. The team is supported by the College of Liberal Arts and the Model UN Alumni Society. Besides Banis, Maze, Loyd and Jacoby, the student delegation included Eric Allen, Joshua Cummins, Stephanie Dagher, Kuyer Fazekas, Michael Gross, Ethan Hall, Samantha Hall, Caroline Hoffman, Jessica Loving, Matthew Piekenbrock, Brianna Rosewater, Cody Smith, Julia Stidham, Hanna Tarbert, Garrett Teets, Mamata Venkat, Suzanne Webb, Brandon Whitehorn and Bradley Wilson.